What? You thought his only job was working the sheep? Attention Dog Lovers! It's time for Weekend Dog Blogging! If you'd like to see more fun dog photos and discover yummy new food blogs, head over to Sweetnicks on Sunday night for the complete roundup. We'd love to have you join us. Just post your pup and e-mail the permalink to Sweetnicks. I love how proud Bear is of all is jobs ! 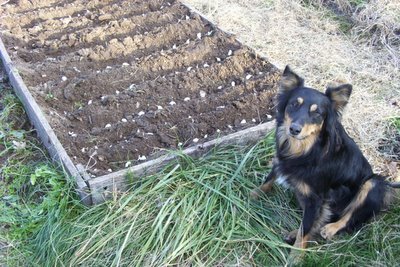 He is as proud of planting the garlic as he is guarding his sheep. We just planted ours too! I *heart* Lucky Buddy Bear. Yes, Bear really is proud when he can help out. He comes from long lines of working dogs that care first and foremost about their jobs. And his enthusiasm is infectious. It's really amazing to watch his instincts kick in (because we certainly didn't train him to do all this stuff). Congratulations. I'm so thrilled we got ours planted. Let's hope for a bumper crop for both of us! Oh what a sweet picture! It makes me miss dogs SO much/ my two Goldens used to sit down with a huge smile on their faces saying "Yes, Yes, didn't I do good?" - didn't matter what = peeing, pooping, eating the garbage. Great picture.